If traditional wedding vows do not fit your needs, use contemporary wedding vows. 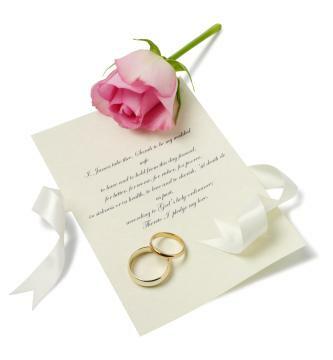 Personalize modern vows to fit your personality as a couple. To many people, traditional wedding vows and ceremonies seem archaic and restrictive. For this group, an exchange of contemporary vows will touch the hearts of all those who attend. Customize the following samples with the couple's names or draw inspiration from them in order to write your own wedding vows. In addition to reciting the vows, couples may like a contemporary poem or a few inspirational verses included in the vow portion of the wedding. Select the vows that best suit your needs. Modify the examples below to meet your personal situation. My love, I dreamed of the day we could stand here together before our friends and family declaring our love. Today with an open heart, I accept you as my spouse and offer you a life of love and understanding. I promise to treat you honorably and to remain faithful to you only. I welcome you into my heart as my loving spouse and I welcome your family warmly and with open arms. Today, I take you as my partner. From this day forward, I give you my heart and my life. My eternal love and devotion belong to you. To you, I pledge myself truthfully and with all my heart. Let us share our dreams, thoughts and lives. Knowing that tomorrow, I will have you in my life fills me with joy. I love you and I will love you forever. I give you this ring as a symbol of our unity and our eternal love. I promise to honor you as an individual and as a person. I accept you, your faith and your ideas. I pledge to love, support and protect you through any storms that lie ahead of us. I know that together, we will build a loving home for our new family. I will be close by when you need me near. I will love you in the good times and the bad. Like this ring, my loving pledge is eternal. You may want to have the officiant presiding over your ceremony to lead you in your vows. This is a great idea if your wedding is faith-based, or if you don't want to memorize the vows yourself. It also works well if you want the congregation or guests involved in your vows. (To the Congregation) Dear ones, today we have the privilege of witnessing the birth of a new family. Stand together as we bless the family with kind words and good thoughts. Please repeat these words after me: "________ and _________ we bless you with kindness, goodness and our earnest prayers. May your lives be intertwined together like God and His goodness. May you always greet one another with a smile and supportive words. We charge you to keep your promise of faithfulness to one another. We, your friends and family stand together in recognition and blessing of your union." Please face one another and take one another's hands. Say these words simultaneously: "My friend and my love, I take you as my partner. With my whole heart, mind and body I accept you. I pledge to cherish you, honor you, consider you and carry you in my heart. Today, I promise to love only you. I recognize you as my spouse and my partner. I forsake all others." Discuss your vows with your partner before the wedding day. Surprising your spouse with special original wedding vows may seem like a good idea, but both people should be involved in the planning so you're on the same page, whether you choose contemporary funny vows or modern simple ones. Practice saying the vows you choose together a few times before the actual event.